These two zero-emissions industry stocks are pushing the envelope. Which one is likelier to outperform? Check out the latest Tesla and Plug Power earnings call transcripts. Picture a company investing in a disruptive, zero-emissions vehicle technology. It's achieved some success in establishing a niche for its product, but profitability has been elusive. Naysayers abound, but some investors are totally sold on the technology and the company. Will it be the pioneer of a green revolution, or bankrupt in five years? This company could easily be the multibillion-dollar, headline-grabbing Tesla (NASDAQ:TSLA), which at this point is practically a household name. Or it could be the multimillion-dollar, under-the-radar Plug Power (NASDAQ:PLUG), which almost nobody has heard of. Let's compare these two to see which one is the better buy right now. Tesla and Plug Power are both invested in the zero-emissions transportation industry. But one is more likely to outperform. Image source: Getty Images. Of course, there's more to the differences between Plug Power and Tesla. Tesla manufactures not only the batteries for its electric vehicles, but also the cars themselves. Meanwhile, Plug Power produces fuel cells that fit into existing forklifts and other industrial vehicles, replacing lead-acid batteries. The charts above show some of the fundamentals for Plug Power and Tesla. Both companies have seen steadily increasing amounts of revenue (blue line) over the last five years, while failing to turn a profit on a trailing-12-month basis (orange line). Instead, they've been keeping afloat by taking on more and more debt (red line) and issuing more shares (green line). Both companies' managements also have a history of promising brighter days just around the corner and then failing to deliver. But Tesla may have a small leg up on Plug Power: It managed to post a quarterly profit in Q3 2018 -- its second quarterly profit in five years -- while Plug Power hasn't posted a single profitable quarter since 2014. Was it just a blip, or the start of a profitable trend for Tesla? Nobody's sure, but Tesla certainly seems to be closer to profitability than Plug Power, at least for the time being. Because neither company is profitable, we can't compare them using traditional valuation metrics like P/E ratio or enterprise value to EBITDA, which can't be computed when earnings are negative. But we can look at how close the companies seem to be coming to turning an annual profit. As previously mentioned, Tesla managed to post a quarterly profit in Q3 2018 -- its first in years -- thanks to finally ramping up production of its Model 3 sedan. During Q3, Tesla delivered 55,840 Model 3s. And the trend is moving in the right direction: Model 3 deliveries increased further in the fourth quarter (although not by quite as much as analysts were hoping) to 63,150. This brought total deliveries of all models to 245,240 in 2018. That's more than double the 102,807 deliveries from the prior year. In theory, more deliveries should yield higher profits, and a consecutive profitable quarter might indicate that Tesla has finally hit on a business model that works. On the other hand, Plug Power is also making more sales than ever, but isn't turning a profit. The bulk of its sales (71% in 2017) go to major partners Amazon and Walmart, which use forklifts powered by Plug Power's cells. But it appears as though those partners -- which are hundreds of times larger than Plug Power by market cap -- may be using their clout to demand such favorable contract terms that the company is unable to turn a profit. And it's not like Plug Power can just walk away from nearly three-quarters of its revenue. For all their similarities, Tesla has something that Plug Power will probably never have: brand power. According to Automotive News, Tesla is the world's seventh-most-valuable car brand, with a value of about $9.4 billion. It also has legions of devoted fans and, of course, hundreds of thousands of Tesla owners worldwide. That brand power and prestige is likely to hold steady no matter how many quarters Tesla goes without making a profit, and no matter how many unorthodox statements are made by controversial CEO Elon Musk. On the other hand, as a non-consumer brand, Plug Power doesn't have this kind of cachet. Even if hydrogen-powered passenger vehicles suddenly become a hot consumer item, the brand prestige would likely go to the automobile manufacturer itself rather than the company making the fuel cells. And when Plug Power talks about "expanding" its cells' applications, it's looking at commercial and mass transit vehicles like the hydrogen-powered delivery truck it recently provided to FedEx. Breaking into this market will be incredibky challenging and investors shouldn't put to much stock into it until we see tangible results. That means that there's going to be more pressure on Plug Power to start turning a profit, and soon. 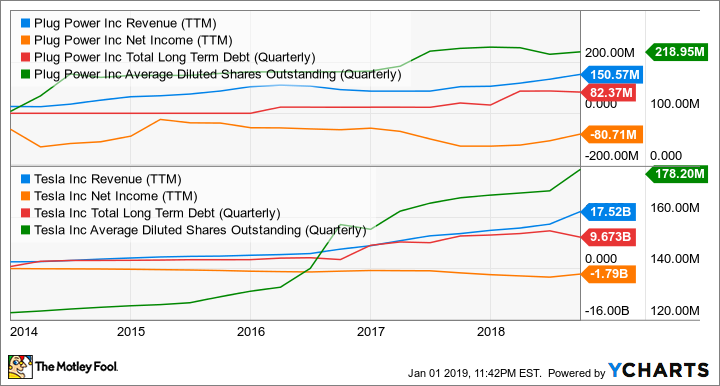 Although Plug Power and Tesla are both experiencing rising revenue but negative annual profits, and both have had to take on debt and issue new shares in recent years, Tesla's position is much stronger than Plug Power's. With its strong brand and recent evidence that it can -- under the right circumstances -- make a profit, Tesla is the better buy. Right now, hydrogen fuel cells are little more than a niche product powering industrial forklifts. While Plug Power clearly has dreams of introducing fuel cells to all kinds of other applications around the globe, today it's a very small company that can't even make money doing what it's doing, even with buy-in from powerful partners. Until that changes, investors should steer clear.